RUGBY NEWS - A new "rapid rugby" competition due to kick off across the Asia-Pacific this year was Thursday delayed until 2020, with its billionaire organiser citing "the intricacies of a World Cup year". Global Rapid Rugby, a fast-paced game with radical new rules, was approved by the sport's global chiefs in November and was initially scheduled to get underway this year. 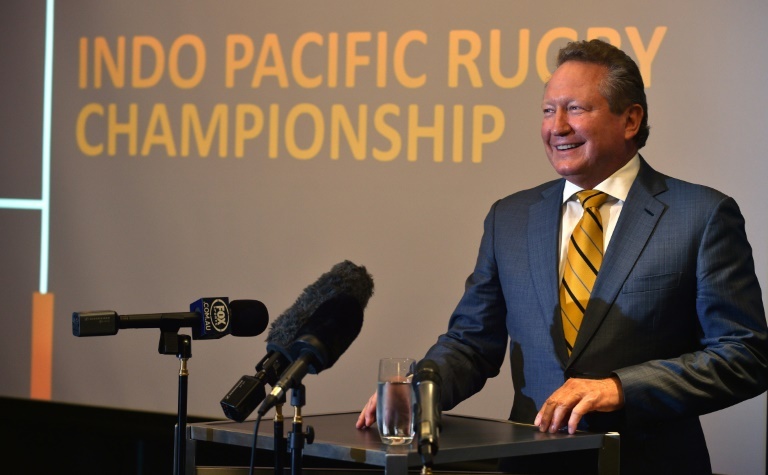 But Australian mining magnate Andrew "Twiggy" Forrest, the brainchild behind the 8-team, 56-game competition, said it would now start in 2020. Instead, this year would see a "Showcase Series" travelling throughout Asia and the Pacific "to give fans, viewers, players and coaches a live taste of what is to come". "In 2019, fans are going to get a real feel for how the entertainment experience we pioneered in Australia last year will evolve throughout the Asia-Pacific," said Forrest. "It will form a runway for the launch of an even bigger investment in 2020, once strong broadcasting arrangements are in place." He said that despite the delay - which was blamed on a "tight time frame and the intricacies of a World Cup year" - the competition remained on track. Rugby's World Cup takes place in Japan begining September. "Making Rapid Rugby a reality has required a considerable amount of courage and determination. That determination, and our vision, has not changed," he said. The concept was sparked by Forrest's outrage at the Perth club he supports - Western Force - being axed from Super Rugby. It builds on his inaugural World Series Rugby event in Perth last year - initially known as the Indo-Pacific Rugby Championship - which featured three teams from Australia and five from the Asia-Pacific. The new format will include a nine-point power try if the move starts within a team's own 22-metre area, reduced times for kick-off and penalties, 10 rolling substitutions and the defence pushed a further five metres back at the scrum.